I love Tom Fishburne’s cartoons! The more that researchers study existing human behavior, activities, and products, the more they get trapped into existing paradigms. These studies lead to incremental improvements, enabling people to do better what they already do, but not to radical change that would enable them to do what they currently do not do. Of course they are not against research – for those who do not know Don is the “Norman” on Nielsen Norman Group – one of the biggest and most influential research institutes in the world and he helped to define what HCD is nowadays. What I think is that disruptive innovations are not common and organizations need to know, get inspired and connect with people, so research is crucial. However, trapping people into a lab-like aquarium and watch a discussion while eat snacks will not be very helpful. 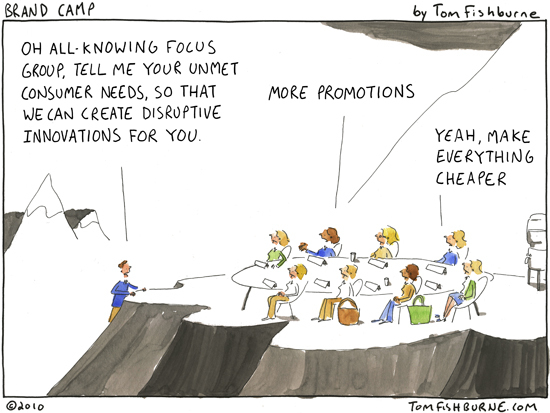 I have moderated many “focus groups” with a diverse range of objectives. From exploring a very abstract concept and its relation to transportation, to very concrete testing where was hard to tell what was prototype and what was a working product. For me the worst part was always the lack of context. Small comments that in a contextual situation (such as house visits) would lead to a conversation around a pan, a ring or a bible ended or simply never happened because the “hook” for the conversation was not there. It is not new that “innovation” people hold some mixed feelings about focus grups, lately Gianfranco Zaccai from Continuum wrote on FastCompany that “Focus Groups Kill Innovation” and after a lot of negative reactions he wrote a more a more friendly article “Focus Groups Are Dangerous. Know When To Use Them“. But why business and focus group live such a happy love story? According to Jenn Schiffman and Defne Civelekoglu from Gravity Tank at their presentation Re-focus Group there are three main reasons for such love. Cost effective – You can have a relatively big group of people coming to a facility and giving answers. Time effective – You can interact with 16 or even more people in a single day, a lot compared to house visits for example. Proven method – It is somehow traditional and known at the clients side. Way easier to understand than more less traditional methods. Their proposal is to develop a more empathetic kind of focus group. Do it in other environments, having researchers, designers, participants and clients together in a more natural conversation. Use rough prototypes to stimulate conversations and so on. Have a look on Gravity Tank’s lecture and gather some tips for future focus groups. The Refocus Group from gravitytank on Vimeo.